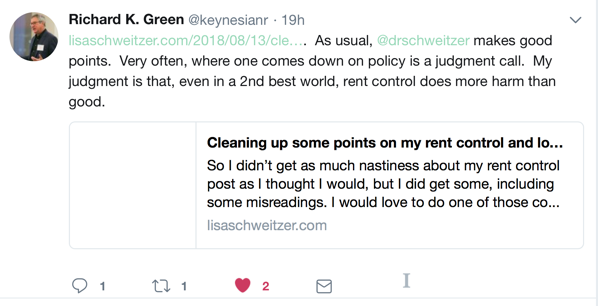 So a self-appointed policy expert with 76 followers came at me yesterday to explain that rent control is just plain bad governance, has nothing to do with capitalism/socialism or labor no matter how much armchair rhetoric I do on it. Rent control harms communities period, the end, there is no debate. This person has to be a troll trying to waste my time because that comment is just silly. This person also let me know that there are TONS OF STUDIES THAT SHOW RENT CONTROL HARMS COMMUNITIES SO THERE HE WINS NEENER NEENER. Of course, there are only about eleventy billion case histories, from around 1845 onward (props to whoever guesses the references) on the political economy of development coalitions showing how renters and communities are harmed rather routinely by new development. I am going to highlight one of my favorite books from this year later in the week on just this topic. Why do the anti-rent control studies get to rule the day for policy but not the abundant evidence we have that development itself can cause tremendous harm to impoverished people and renters? Because unlike we scientifical neoclassically trained economists, those little community studies are done by people with a (gasp!) political agenda! Unlike wonderful, objective us. Our studies are just so durn wonderful that our Complete Objectivity(TM) affirms our priors. Yay,us. If you actually believe this, I got a fancy bridge in New York to sell you. There you have the difference between an actual policy expert and some loudmouth who thinks his beliefs are answers. Anybody who studies policy knows seriously that we don’t know as much as we’d really like to. We have to make decisions with imperfect information–otherwise we would get nothing done. And waiting too long to do something can be just as bad, if not worse, than doing nothing. But all that should make us go forward with humility and flexibility. A great deal of policy is judgment, sadly. Richard’s judgment on rent control is “no.” I get why Richard reads the literature the way he does. My judgment is…”I wouldn’t rule it out right away granted our existing conditions. There are some debatable things here. What is the specific proposal?” No, I wouldn’t get on board with a policy covering all LA County in perpetuity. But around a specific development project instead of limp “community benefits” nobody delivers? I’d read the proposal, for sure. WOW!! THAT LISA IS SUCH A RADICAL. Now, Richard is an economist and a MAN and all, and he’s taking my “It’s kinda debatable” seriously even if he is a no, so can ya just respect him a little and get outta my face? So here’s another one of my genuinely brilliant colleagues: Antonio Bento. Now, you would have to be some special onions to be smarter than Antonio even if you have convinced yourself you are smarter than me because Antonio and Richard are both very sharp. And Antonio is willing to grant I have a point– noting that ‘second-best’ part. Ultimately, I have questions about just how big a trough we have in calling something “second-best” versus “third-best” versus “oh ratpoop, it’s all FUBAR” when it comes to housing and land. When I get musing about UBIs, people jump on me and say “landlords will just up rents by X amount.” Now that is a straight-up market power argument even if it’s not couched as such. There are always theoretical and empirical questions, and these questions are not analytically straightforward by any means. When you think about it, all I am really saying is that if you want to take rent control off the table and you want it to stay off, you should probably come up with a better idea for renters and laborers than “Oh, just let us build what we want, it will trickle down in time. We’ll take care of ya.” Otherwise people will use democratic politics to use whatever influence they can vis-a-vis the long odds of development politics against them.